Recently, I completed a one-month challenge designed to increase the size of the upper arms by way of high-volume training. 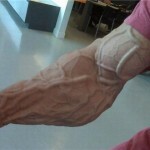 I was happy with the results of the experiment (at least 1/4 inch gain on the upper arm and noticeably larger forearms) so in this article I’ll give you the exact protocol. First, let me give credit where credit is due. I got the idea for this protocol from Chris Shugart’s “Chin Up Challenge” article which ran in October of 2013. I did things a little different than he advised but that’s where the original idea came from. This is a high-volume chin-up program. It was designed for somebody who can already do at least 12 chin-ups in a row. If you cannot do 12 chin-ups in a row, you can still follow this program (more on this later.) If you cannot yet do even a single chin-up, this program will not work for you. Lose weight, get stronger, and then come back to this program down the road. This program calls for chin-ups to be done multiple times per day, six days a week. 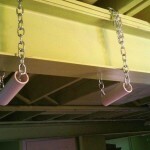 So unless you literally live in a gym, you’ll need a doorway chin-up bar or some other apparatus in or around your residence that will allow you to knock out chin-ups frequently. This program is designed to be done IN ADDITION to your regular training program. You’re going to perform sets of 10 chin-ups throughout the day. It doesn’t matter if you can do 15, 20 or more… you will only perform 10 reps. Never go to failure. Spread out your sets over the course of the day — leaving at least an hour in between each set. Start gradually. The first day you may only do 3 sets of 10 chin-ups. You will try to increase the total number of sets done each WEEK. On Saturday, we change things up a bit. Instead of doing multiple sets throughout the day, you’re going to simply set a timer for 5 minutes and knock out as many chins as you can in 5 minutes. Go to failure if you want. Each week, you should strive to do more TOTAL chins than you did the week before. Each Saturday, you should also strive to do more chins in that 5 minute block than you did the previous Saturday. I made a small tweak to the original program. Instead of using regular chin-ups, I did “thick bar” chins. This was actually an accident. I went to Home Depot to purchase my supplies: A few feet of chain, some connectors and a couple pieces of PVC pipe. Well, the pipe I bought was thicker than your average bar and I didn’t realize it until after the fact. No matter. So I performed all my chins using this thick-bar set-up. 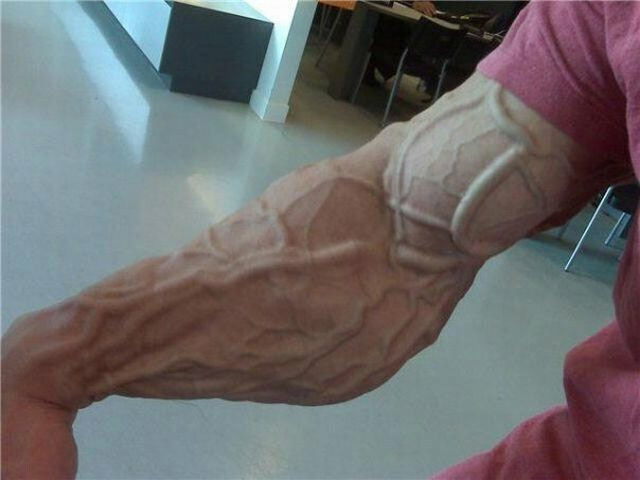 Frankly, I think it was a happy accident as my forearms got a nice boost from all the extra work. My $9 home-made chin-up station. I work out of my home in my lime green basement. 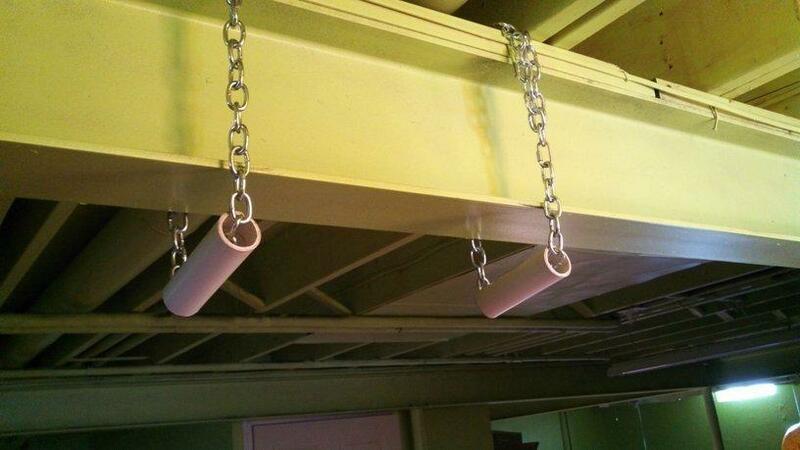 I have an I-beam right next to my desk so I simply rigged up the chain and the PVC pipes. Total cost? $9.52. Using this set-up, I performed hundreds of parallel-grip, thick-bar chins. This is how I performed the bulk of my chin-ups. For variety’s sake, I’d occasionally change this up. Once in a while I’d simply grab the I-beam and knock out some traditional chin-ups. On days when I actually went to the gym, I’d “bookend” my workouts by starting and ending the workout with a set of 10 regular pull-ups (palms away). 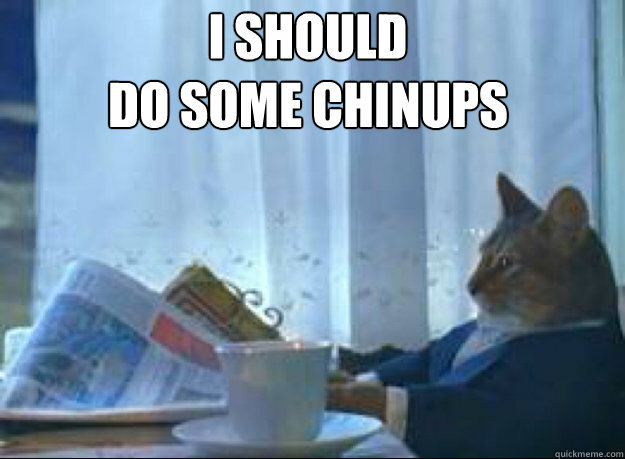 On the first Monday I performed a modest 30 total chin-ups. 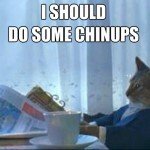 In the 4th week, I did as many as 100 chin-ups in a single day. 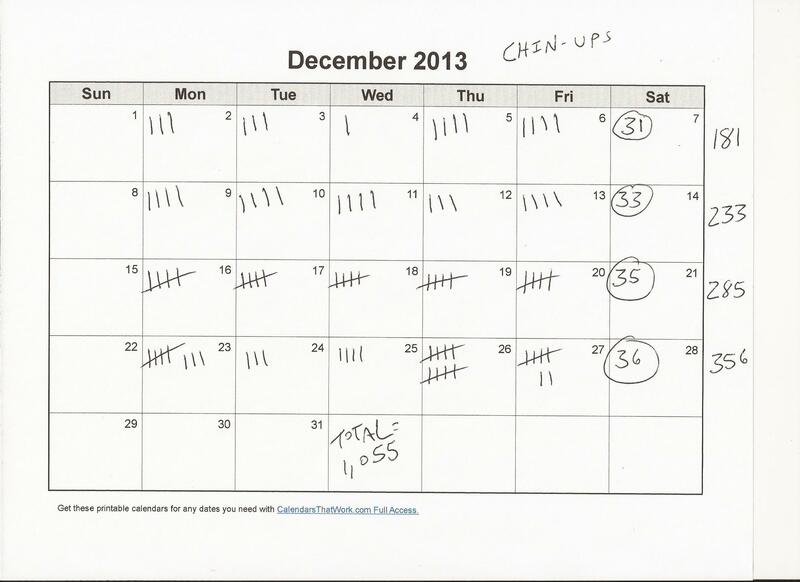 Over the course of the entire month, I knocked out 1,055 chin-ups. As you can see, I started gradually. 181 chins complete in the first week. 285 the third week and 356 in the 4th and final week. Which everybody knows is a huge turn on for the ladies. My back seemed to improve as well. Oh yeah… I got better at doing chin-ups too. My previous best was 17 or 18 chin-ups (can’t quite remember) in a row. After 30 days on this experiment, I went into the gym and knocked out 20 straight chins — only stopping because my hamstring cramped up. #1) On any high-rep arm program, there’s always the concern with your elbows getting inflamed. The only time my elbows started to get “hot” was the day after I did 100 chin-ups in a single day. I think I was able to avoid the typical overuse injuries because I built up the volume GRADUALLY. #2) I didn’t see massive improvements on my Saturday 5 minute challenge results. This is mainly because my grip would always burn out quickly and once the grip is gone, you’re stuck doing single reps until the timer goes off. If you do this challenge with traditional chin-ups, I would expect to see greater progress on your 5-minute challenge Saturdays. #3) After the 4 weeks are up, I’d recommend pulling the plug on this program and putting it on the shelf. This is a good short-term program, but trying to turn a short-term program into a longer-term routine is rarely a good idea. #4) If you cannot do at least 12 chin-ups, then here’s how to “scale down” this program and make it work for you. Find out how many chin-ups you CAN do in a row. If it’s 5 or less, I would not attempt this program until you’re stronger. But assuming you can do between 6-11 chin-ups in a row, here’s how to make this work: Test your max chin-ups. Let’s say you can do 7 in a row. Cut that number in half, and if necessary round down. So half of 7 rounded down is 3. Now you’re going to run the program as written but instead of doing sets of 10, you will do sets of 3. Same rules apply. You will still rest on Sunday and have the five minute challenge on Saturdays. But on Monday thru Friday you only do multiple sets of 3-reps throughout the day. #5) Need a little MORE motivation? This is a picture of old-time strongman & bodybuilder Mike Dayton. 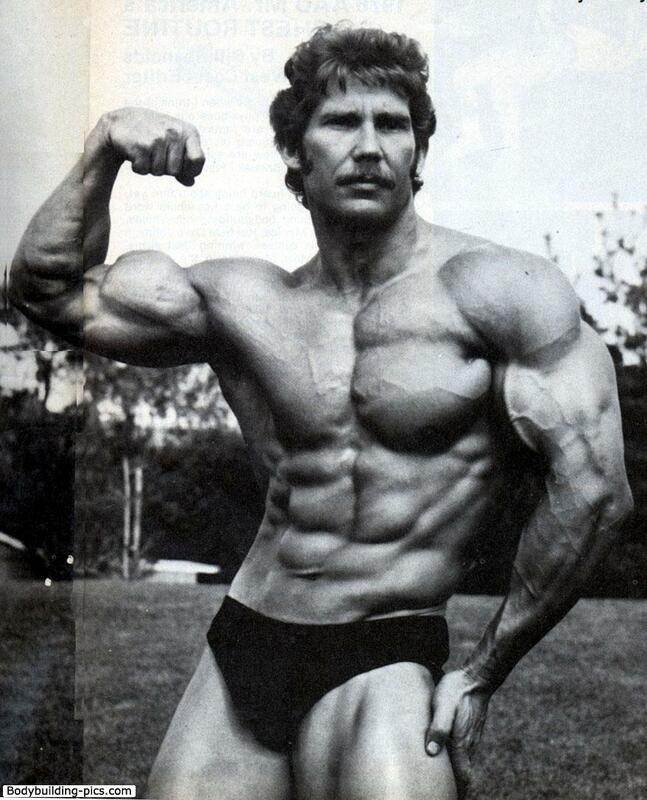 At a bodyweight of 198lbs, he did a whopping 85 consecutive chin-ups. And as you can see, he wasn’t lacking in arm size. the chin-up bar is calling your name. Great program! Will do this when I’m done training my planche. It’s heavy resistance right now with low volume, but I look forward to high rep chins after I can hold my straddle planche for at least 10 seconds. Fantastic! I am at the end of week 3 of this protocol, doing a set of 4 reps a couple of times a day. Before I started the program, I was able to do 6 perfect chin ups (2 seconds up – 2 seconds down), now I can do 8 continuous repetitions. The most I did were 10 sets of 4 repetitions over the course of a day, and so far I haven’t experienced any problems with my joints. I use rings and rotate my hands from a parallel (palms facing each other) to a supinated position. Thanks a lot for sharing this program!